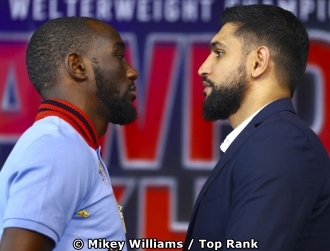 NEW YORK CITY (Jan. 17, 2019) — Fresh off their kickoff press conference in London, WBO welterweight world champion Terence “Bud” Crawford and Amir “King” Khan flew across the pond for a special press conference at ESPN’s South Street Seaport studios in lower Manhattan. "Amir Khan has been in there with a lot of great fighters. Me beating him will put me on another level in the welterweight division. People are interested in seeing this fight." "It don't matter how I win. I just want to win. That still won't get the fighters I want to fight in the ring with me. I just need to keep doing what I'm doing." "There's no animosity between me and Amir. He respects me. I respect him. We'll do our thing in the ring on April 20, and we'll shake hands when it's over." “This is a fight that can redeem my whole career. Against Canelo, maybe I was biting off more than I could chew. I took that fight because it was a massive opportunity for me, and I believe in myself as a fighter. This fight, I see that it’s more fair. We’re similar weights. We’ve had similar experience. In my opinion, I’ll be able to take his punching power. He’s also a quick and a skillful fighter, so there’s a lot of advantages for me in this fight. In other fights, I’ve fought guys who are a lot stronger, a lot bigger in weight. That plays a big part. In this fight, I really think I have the style and everything it takes to win."